Chinese President Hu Jintao, who has toured Yunnan Province over the past few days, has urged people of different ethnic groups to be united and make joint efforts to achieve common prosperity and development. During his trip in this southwestern province, where a large ethnic population lives, the Chinese leader visited local villages, factories and research institutions, showing his interest in the implementation of a scientific concept of development and the building of a harmonious socialist society. In talks with local business people, Hu called for fundamental change in the mode of economic growth and readjustment in economic structure, in order to maintain a sound biological environment while achieving economic development and leading a rich life. 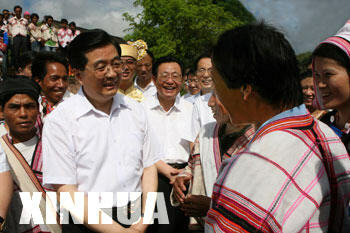 In his visit to local villages in Simao City, Hu questioned villagers on issues of family income, power supply, drinking water, schooling, and medical services. He called on a service center for poor urbanites and a help center for migrant workers from the countryside in Kunming, the provincial capital. He urged trade unions to help protect the rights of migrant workers. The places Hu visited included a village of the Dai People, where villagers have improved their income through hard work, as well as a village of Jinuo People, a small ethnic group. During his stay in these two ethnic villages, Hu greeted medical workers to celebrate the International Nurse Day on May 12. Hu, who is also the Chairman of the Central Military Commission, had a meeting with senior Army officers from the barracks of the Chinese People's Liberation Army (PLA) in Kunming.